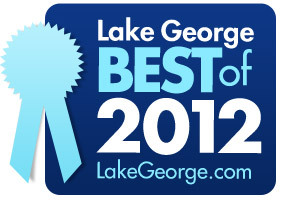 The results are in for the 2012 Best Of Lake George Survey! Every year, Lake George locals and tourists give their thoughts on the best restaurants, hotels, attractions and more in the Lake George region. The businesses that receive the most votes are declared the "BEST OF LAKE GEORGE" for the year. Browse the categories below to see which Lake George area venues and attractions won in 2012! The BEST OF LAKE GEORGE Survey is sponsored by LakeGeorge.com. These top rated lodging venues are worth a look for those seeking a Lake George getaway! See the best places to get different types of food and drink in Lake George! These were voted the best sources of entertainment in the Lake George area!